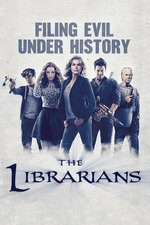 Cases of people spontaneously combusting lead the Librarians to a holistic spa run by [spoiler]. *...to a holistic spa run by vampires who have discovered the secret to walking in the sun. *Cassie learns that her brain tumor has reached fatal proportions, avoids surgery for fear it will destroy her cognitive genius abilities, inexplicably declares her love for Jenkins and asks him on a date which he turns down, has some chemistry with Estrella the good vampire. After the big evil-vampires-versus-Librarians fight, Cassie has a dramatic collapse and is whisked away to the hospital for surgery, and wakes to discover that her magic math powers have grown rather than disappeared. Then later she and Estrella kiss. *Flynn takes Baird for a romantic dinner in an Alaskan forest, and is about to reveal some secret to her but they are interrupted by the news of Cassie's imminent surgery. So, that was bizarre, right? Cassie/Jenkins? I would say yay for canon-bisexual Cassandra, but, since when has there been any indication whatsoever that Cassie was interested in Jenkins? This way felt like some kind of elaborate 'no-homo' to try to downplay Cassie/Estrella. Yeah that was really really weird. Are we supposed to think Cassie was just trying to get close to him because he's immortal and she was fearing death? That just doesn't seem right, not even desperate-grief-decision right. Amusingly, I spent the couple minutes before the kiss thinking, Ugh, they're just going to tease us, there's never going to be anything that could be considered conclusive proof that the girls have kissy feelings toward each other. But then! Smooches! So that was good. But... yeah. WTF the rest of it. I read it as "fearing death and wanting something interpersonally good before that happened." And there have been hints of her being fond (fondness type unspecified) of Jenkins before this: I'd have to go dig for them, but I remember at least a few "This specific detail, right?" between them. I did rather like the fight scene, but I like getting to watch Jenkins fight. I presume the interrupted Flynn reveal was going to be "I would have to die to use this weapon we got last episode." Asking Jenkins out felt weird but I think they 90% set it up as okay because she was being weird. If ever you had an excuse for being weird, this was it. I think it needed slightly better dialog to make it more believable, both for a "why Jenkins?" and because I don't feel like we've ever seen Cassandra hint at being a sexual being with men before. Plenty of "interesting..." moments with her and other women but I can't recall her presenting any interest about men. So that's sort of a two steps forward, one step back in the sense that it feels kind of like a het-by-default thing; since she's never explicitly rejected the idea of interest with men then that must be in there too. Though I guess we could think of her as actually not that interested in men but her options for a desperation grab at something didn't leave her any female options unless she went for Estrella, which would not work for a trying to hold on to my current life move. I'm also willing to give them a bit of a pass because it was a great setup for a very tragic bit for Jenkins. An oath he won't/can't break to forever and only love someone who not only picked someone else but who is now long dead. That's unbelievably tragic. Really, if we want to look past the surface there's other motivational issues here too. Estrella and her mom are these "we don't kill" figures but there's never any great reason presented as to why they hold this position. It's a perfectly pragmatic one if you have no choice but to stay in one place; dead guests aren't repeat customers and probably scare of new customers. But we don't get any great moral explanation as to why they wouldn't be interested in being able to both travel and go back to being apex predators. Mom came to that place weary of her existence but I don't remember her saying it was because she didn't want to kill anymore. I guess we saw that many if not most of them did want to go back to that. Jenkins dispatches, what, about a full dozen?